4 years ago today, Sarah sent out this email to our very best friends and family after Jon’s accident at Ski Cooper in Leadville, CO. While skiing as a family, Jon lost control and hit a tree at a very high rate of speed. He survived the crash and is doing very well in the years that have now passed, but this note was a good reminder of how blessed we are to still have him with us and how much the community around us matters. Our friends at Shadow Lake, my co-workers at Gallup, our friends in Denver and in a huge way, our families, rallied around us to provide some of the best support and care I have ever seen. We still owe you all a huge thanks! I am teary as I write this today, some 4 years later because it all still matters. Jon is doing great, and for that Sarah and I are very thankful. Hug your kids today! A good number of you heard yesterday what happened to our Jonathan, but for those of you who don’t and to fill in details, I will start from the beginning…. 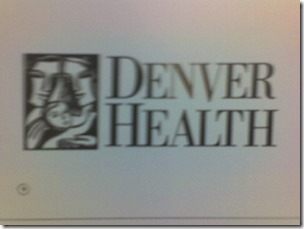 The trauma team here at Denver Health Med Center have been amazing. 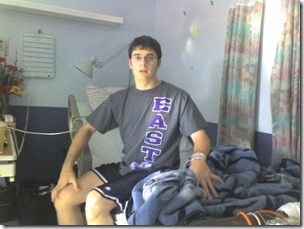 They’ve been very committed to and forthcoming about Jon’s treatment and care. He has a host of doctors seeing to him. Where things stand right now: Jon has been unconscious since the accident; they’ve had to keep him that way to maintain that bleeding and swelling. 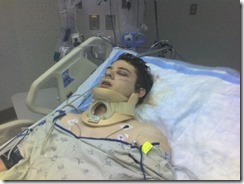 He has several fractures to the left side of his face and around his ear on that side. He has swelling and bleeding in the brain but it has been minimal and they inserted an intracranial pressure monitor to make sure that swelling doesn’t increase to dangerous levels. He has a fractured sternum and one fractured rib, but those will heal on their own; no measures necessary there at this time. The CT scans have all shown no other major injuries to major organs, neck or spine. He’s been moving a lot in his sedation, which is a good sign – no paralysis. Because the swelling and bleeding have stabilized they are slowly bringing him out of sedation and will see how he responds and get an assessment of where he is neurologically. At this point, only God knows the damage done there and we are praying fervently that our Jon will still “be there” when he wakes up. He did respond briefly and open his eyes on the nurses command in the night under light sedation but did not repeat it for the Dr. later. We’re being told to expect to be here the week at least, he will likely need therapy for any number of things neurologically speaking, but it’s too soon to tell how that will look. He will need repairs to the many fractures in his face and jaw on the left side after Neurosurgery releases him for that and swelling goes down. Josh’s friend Shay traveled here with us in his Dad’s truck. We will be sending him and Phil home in the truck today with their things and the skiis. Timothy is home in the care of my friend Judy still recovering from his broken leg. (Only about 3.5 weeks left in a half cast there. He’s doing well.) Jim’s brother Mark and his wife Wendy happened to be in town from the Springs last night and have stayed here with us. They are going to take Josh and Samantha for at least the next 24 hrs till we know more and see how Jon responds. We also have some good friends here in Denver who being a big support and help and more are getting in touch as they learn of our circumstances.